Southwell Minster is delighted to announce that they are hosting what is possibly the biggest textiles exhibition by a single artist in the world. This spectacular and ground-breaking exhibition of textile art by Jacqui Parkinson is on show from 16 October to 30 November in the Quire Aisles of the Minster, the final stop of an extensive tour of cathedrals across Britain. Threads through Revelation uses superb stitching and vivid colour to depict the Bible’s Book of Revelation. 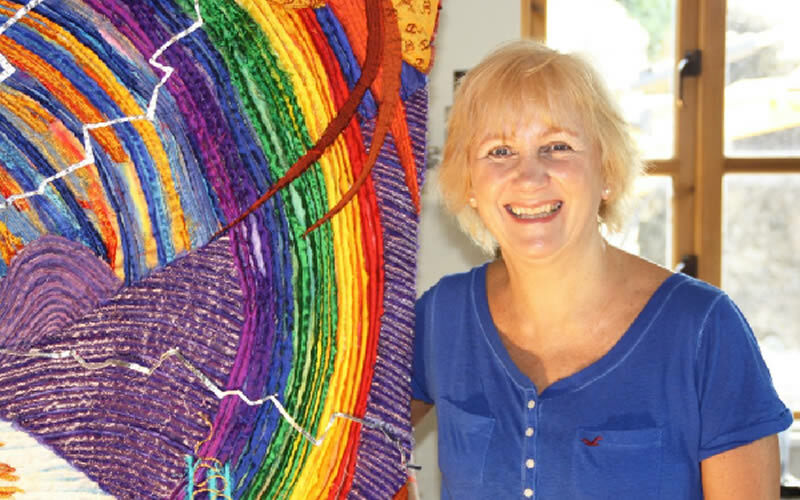 Jacqui, who lives in Devon, is a textile artist whose work has been on display in many cathedrals over the past 12 years. Her exhibitions have included different themes, including prayer, grief, creation, service and rites of passage. They have generated very warm responses from visitors, guides and congregations. Jacqui started on this ambitious piece of work four years ago, and has distilled the complex narrative of the last book of the Bible into 14 very large panels – made from old bedsheets – each nearly 3m high and varying in width between 1m and 3m. This remarkable project put side to side makes up nearly 30 metres of textile art – which took over 3½ years to complete – and has more than eleven million stiches! She uses some unusual – and possibly unique – techniques: a combination of painted dyes and multi-layered silks cut to create an extraordinary frayed effect and then additional appliqued silks and metallic leathers stitched on top, with some real gold gilding. All the places and characters in the vision are larger than life and out of this world. The vivid colours of the dyes and silks help to convey the imagery of this epic narrative with drama and excitement. Jacqui continues: “I enjoy the idea of working with ordinary bed sheets: sheets that hold all our dreams and hopes – all our sorrows and tears – sheets that cover us at birth and at death. Then I transform the sheets with vibrant dyes and dazzling silks – changing them from something ordinary to something extraordinary.